I have decided to do the scheduling a little different this time around. 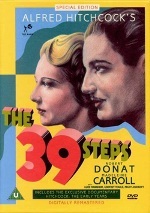 Starting of with "The 39 Steps", I will give each movie one week until the deadline to view it passes. Should all reviewers of the movie (listed in the first post) have posted their reviews of the current movie before the deadline comes up, we move on to the next movie with a new week starting until the deadline. Dragonfire and Jon, you are welcome to post your reviews of the movies listed before "The 39 Steps" also in this first week. Deadline for "The 39 Steps" is April 12th. My first Hitchcock movie that I have ever watched. The movie was alright. Of course the story is not something new from today's standpoint, but I can see, that for its time the movie was innovative. And we're off! Well done Tom for pulling this together. Bob Lawrence (Leslie Banks), is holidaying in Switzerland with his wife Jill (Edna Best) and daughter Betty (Nova Pilbeam). A Frenchman they have befriended is murdered in front of him, whispering about a planned assassination that wil put the British government in jeopardy. Betty is abducted to ensure Bob's silence until after the assassin (Peter Lorre) has carried out his grim task in the planned setting of the Albert Hall. How can Bob do his patriotic duty but at the same time keep his daughter out of danger? Paul Merton recently called this the first proper Hitchcock movie, after his run of silent films culminated in using sound for the first time in the previous film, Blackmail. That’s as maybe, but it has dated in many respects. The first half is quite laborious, with the very strange overly relaxed 30s attitudes; a young girl almost causes a fatal accident, then ruins her mum’s chances in a shooting competition, yet they all just laugh and call her a cheeky scamp. Relationships are fuzzy, though I bet if you watch closely enough, that must have been shocking to 30s sensibilities. Later, our reluctant hero on the trail of the kidnappers never forgets his polite humour with Peter Lorre’s fantastic villain, without a trace of irony, even in the middle of a scrap. It’s the old British spirit taken a little too far! In The Lady Vanishes, there are two cricket fans that fall into this style, but they’re funny because of the contrast. Still, a cracking cast able to produce a lot of humour from a serious yarn. Once the plot is firmly underway though and the action moves back to England, it’s a tour de force displaying many of what would become signature traits. Normal people in terrible peril and involved in a plot much bigger than them (causes a tangible moral dilemma here); fully rounded supporting characters (check out the character details in people turned out of their homes by the police); gags before violence (a wonderful, indulgent scene with wool); gags during violence (chair fight! ); an East End gun-fight with police that Michael Mann has probably seen a few times and the magnificent Albert Hall just before it (a plot point recently borrowed for Eagle Eye). It is a great story, with a delicious premise, in many ways a definitive Hitchcock template, balancing several big set-pieces in multiple locations. It’s just tough for modern audiences to watch and I think one of Hitchcock’s greatest traits has yet to really show: the deep, black humour, which can verge on cruel. I'm not off to a good start with this one yet...stupid work schedule changed and I had to work more than expected..but I will get to these...I just may be lagging a tad behind for the time being. The deadline for "The 39 Steps" passed yesterday. Deadline for "Secrect Agent" is next Sunday. Of course you are still welcome to post reviews for "The 39 Steps". I'm watching 39 Steps tonight. I might only make it to 38, but I'll try my best! This movie didn't keep much of my attention. It may be because of the relative poor quality of the transfer. But what I liked about this movie is something, which most of the modern English-language movies seem not to be able to do anymore: Use actors who actually speak real German for the German roles. I know I'm already behind. I'll get caught up as soon as I can. I may be going mad (going?, you say ) but I could have sworn I'd read someones review of 39 Steps, but Tom is the only one so far and there were specific points mentioned that aren't there... er... "anymore"... I'm confused. Richard Hannay (Robert Donat) picks up Annabella Smith (Lucie Mannheim) at a music hall, but he finds her behaviour strange. She tells him she is a spy and warns he is now involved. Indeed, she is soon murdered and he is the only suspect and on the run to Scotland, with the one lead she gave him. Along the way he meets Pamela (Madeleine Carroll) and soon she is also caught up in discovering just what The 39 Steps are. What a difference a year makes! My only real problem with The Man Who Knew Too Much was the quaint attitudes of the thin characters that severely dated the story. Here there is no such problem and it has stood the test of time as well as any film from the period. It’s a rollicking good thriller that has been an inspiration to so many and still is. They could do with watching a bit closer though, because it has so much more invention and ambition. It's as watchable now as any other spy caper. Take the sequence of the maid discovering the body and her scream being the train whistle. So soon after sound had been introduced to film and already Hitchcock is pushing the technique. In fact the whole train sequence is a joy to watch for the details. As always, plenty of characters like his fellow passengers that add little to the plot, but enrich the film nonetheless. Throughout the film, there are endless grace notes making the plot both thrilling and fun. It’s magnificent. More of Hitchcock’s regular quirks are appearing, for instance, sexual obsession is rearing its head but balanced by the wonderful chemistry between Donat and Carroll. Once more the action follows a normal guy dragged into extraordinary events, manipulated by a woman; perhaps he should have thought with his head? Later, while he is handcuffed to Carroll (a blonde, of course), the brilliant rollercoaster farce (fence!) gives way to the very famous moment with the stockings. It’s ingenious. Morals of the day would never have allowed such unresolved contact, except, how could he help it, being chained to her? Ooh, bit Freudian that! It’s a gloriously theatrical film as well, from the dramatic murder, the twist in the sheriff’s office (followed by an enthusiastic dive out the window!) to the finale, literally on a stage. Hitchcock spent a lot of time with German filmmakers and their expressionistic methods have had a huge influence. Add to this that he was the master of audience manipulation, so the irony of the story concluding theatrically on a stage in front of a horrified audience should not be lost. That you can watch this for nerdy film anorak material and/or as a purely exciting thriller, is testament to Hitchcock’s immense skill. Novelist Edgar Brodie (John Gielgud) has his death faked by British Intellgence. Giving him a new identity as Richard Ashenden, they persuade him to undertake an espionage commission in Switzerland. Accompanied by beautiful Elsa Carrington (Madeleine Carroll), posing as his wife, and the General (Peter Lorre), an insane professional killer, Brodie/Ashenden becomes embroiled in murder, intrique and a pursuit through the Swiss Alps. A misleading poster, whimsical unfocused plot, poorly cast, indifferent directing; there’s little to recommend this oddity. Hitchcock seemed to have several gears, and though he was never a bad director, his first gear was “bored”! I think you can really tell when he isn’t passionate about the story he’s filming. Lack of an everyman getting in too deep is the first difference, but Hitchcock’s plots are usually about a love affair with adventure and crime conspiring to keep them apart that only really becomes acknowledged in the final moments. The 39 Steps was a perfect example with fantastic chemistry, but the small fact he was on the run as a suspected murderer had to come first. 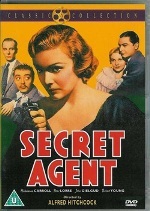 Secret Agent is almost the opposite with a ridiculously obvious romance being hindered by a pesky spy story! I do like John Gielgud and was looking forward to seeing this early role, but undercover war hero novelist doesn’t suit him in the slightest! It’s an oddly written character from the start, but I did enjoy a moment that may have inspired James Bond: Arrogant English agent arrives at hotel to be told his wife is already there, and he enjoys the potentially dangerous situation so much he plays up to it. Sadly it didn’t deliver much more. It did have some potential in the middle section when an innocent man is murdered. It is a truly awful moment after all the light-hearted whimsy. 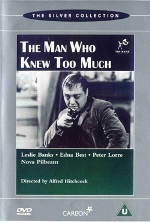 Unfortunately, rather than dig into the damaged psyches, the plot goes back to silly double-crosses and way too much Peter Lorre. His was the best character, but he really overplayed it and the ending was one of the most contrived moments I’ve ever seen on film. I forgot to post the deadline for "Sabotage". It's on 2009-04-26. I'm disappointed not to have this in time to watch for the marathon because it's a small milestone in Hitchcock's career in that it contains a scene that he considered to be a mistake and one he would never repeat. I don't know when people started to refer to him as the Master of Suspense, but I think this moment was instrumental in his own perception of what suspense should be. Although I haven't seen the film properly, I've heard the story behind it several times and often think of it because so many new films would benefit from that same understanding instead of going for the short shock every time. Hopefully you have no idea which bit I'm talking about!